Archive - Twokinds - 15 Years on the Net! Click on the chapters to display thumbnails! The human Trace and keidran Flora spend the first night together. Flora’s ex, Sythe, makes his first appearance! Our duo reach their first village and encounter a new ally: the basitin outcast, Keith. Trace also encounters several people from his past for the first time: the tavern sisters, Maren and Karen, and Trace’s old friend [database error]. A goal is set: find a ship and sail to the Basitin Isles. But trust is hard when it’s between three very different species. Leaving Keith behind, Trace and Flora make a stop in a new city, larger than the last, looking for aid and supplies. But Trace’s past friends have followed him here, intent to bring him back and restore his memories! The party reunites with Keith, on the promise that he won’t antagonize Flora. As they leave, Flora runs into Euchre, a friend from her time as a slave. Things go wrong as they try to free him. Trace loses control for the first time. Flora and Trace make up, and romantic feelings begin to blossom. Euchre and the team part ways. They almost immediately become lost, while Euchre is hinted to not be quite so benine. The concept of feral keidran and estrus are brought up for the first time. More of Keith’s past is revealed, as well as his animosity towards keidran. The party believe they’ve reached a port city, but something is off. Saria, Trace’s past wife, makes her first apperance. Flora experiences feelings of jealousy and selfloathing, which make her vulnerable to Ephemeral, a mask-like spirit. Flora becomes possessed by Ephemeral, who uses her body to fight the party. Trace begins to lose control a second time, but Euchre intervenes. Trace connects with Flora mentally, which weakens Ephemeral’s hold enough to be broken. It is revealed that the port city was a huge illusionary trap set up by the mask, and Saria says goodbye. The team travel south near the wolf border to reach the real port city, Wreathwood. Trace and Flora spend their first night together, and the masks meddle, as they do. Wolf assassins attack! Trace mistakenly uses black magic for the first time and summons a demon, which ends the fight. The dragoness, Lady Nora, makes her first appearance, much to everyone’s shock. Wolf assassin Natani joins the party! The four reach Wreathwood in time for a festival. Resident perv, Eric, provides the party with a ship. Kathrin shows up! And things are revealed about Natani. Two things. Eric’s brother Roderick is a prick. Natani’s first flashback. The party de-ports! Flora poses for a painting, while Keith and Natani spar. During the voyage, Natani has… gender-related troubles, but Keith helps. Not like that. Basitin Island spotted! Look at all the Keiths! The generals show up, including an old friend of Keith’s, Alaric. Mike is pranked by Nora. Keith reveals his family past. Trace’s past with Saria is also shown by Nora. But uh-oh, Templar are here too! Keith is ordered to kill Natani, believed (correctly) to be a wolf spy. Laura! Keith and Laura have an awkward, then teary reunion. Trace is captured. Keith stalls his orders by asking about Natani’s past, and the mental link is explained. Keith tries to kill Natani. Then… kiss? Tavern’s on fire, so they get out and formulate a plan to get Trace back. Keith fights Alaric, which ends badly. King Adelaide! General Alabaster screws everything up. Laura gives them the chance to destroy the tower. Quickly, Team B! They’re forced to flee from wolves. Aftermath of battle. Keith goes on trial. His true family past is laid out. Keith’s friends risk execution, but, with the help of Lynn and King Adelaide, Keith is made general. All according to Alaric’s plan. Trace learns the consequences of using black magic. Laura says her fairwell. Team B travel make plans to travel to Lyn’knoll, the free city. Everyone on Team A regroup and set sail, following the funeral. A stowaway is on board. Trouble starts between the slaves, wanting freedom. Fire breaks out on the ship, and Natani loses her favorite robe. Kathrin shows her true feelings to Eric, and the stowaway (and true cause of the fire) is revealed. Keith experiences depression following his loss. Another stowaway, Lynn, shows up. Meanwhile, on Team B, Zen prepares to capture Sythe. 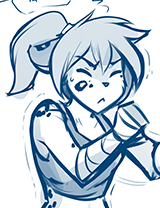 Raine’s hidden secret ends up being revealed during the fight, but Zen is fended off. Natani creates an illusion of Laura at Keith’s request, to say goodbye, but can’t let her go, despite the spell feeding off his life. A now much furrier Raine explains to Team B about her past and father, Euchre. The red-haired guy is racist. Natani goes to Kathrin for clothing help, and while together they have some ‘girl talk’. Flora’s pregnancy is revealed to Trace. A huge fight breaks out, but the Laura illusion finally convinces Keith to say goodbye and move on. Ten years of Twokinds! The main four reminisce about the time they’ve shared together. On Team B, Maren and Karen are out cold due to Zen’s poison. Stuck, Raine and Red talk about what it’s like to be a wolf. Zen strikes again, but is struck out! On Team A, Natani helps Keith, and feelings finally start to be admitted. Kiss! Team B argue what to do with Zen. Maren and Karen wake and meet the new Raine. They agree to use the magic-nullifying collar, but to disastrous results. Team A finally reach land at Flora’s old home village. Keith is determined to heal Natani. War with wolves is escalating. Flora reunites with her old ‘brother’ Kei. They agree to meet at Riftwall tavern, where Adira and Maeve make first apperances! A tiger meeting is taking place. Keith and Co. fight mercinaries looking for wolves, led by Saraphina. Fight ends via Dragon Princess. Tiger meet begins… it’s a trap! Meanwhile, Natani battles her inner demons. Team B continues traveling west towards Lyn’knoll & Edinmire. They rest for the night at a hotspring. Trace and co are being escorted to the Legacy Manor. They meet Princess Reni once again and she reads his mind. An older Roselyn is revealed to be the manor’s caretaker. With Edinmire’s prison destroyed, captured wolves are being sent to the manor’s dungeons. Team A take some time to rest, with Natani and Keith getting some alone time. “Wanna touch ‘em?” The next morning, trouble finds Team B in the form of Carver! Clovis, Carver’s boss, is hinted at. Carver is defeated, but Zen is injured. Reni rushes to Team B’s aid, and the groups finally unite once more! While recovering from the flight, Reni describes her lineage & dragon hierarchy. The group gate back via gatekey. Euchre gives Rose a warning. Carver’s fate. Zen wakes up in the manor hospital with Kathrin. Trace and Rose have a talk, as do Natani and Zen. Mike and Evals discover the Oasis Room discuss their future. Maddie and Karen find a secret hallway and get into trouble with a stone guardian, leading to Rose becoming unshackled. Maddie reveals the truth. Meanwhile, Raine has a problem.